Discipleship. It’s a great thing. Some people love it; others, not so much. Some are successful; others, not so much. This is the best way, bar none. If you want to totally fail at discipleship, just don’t bother to try. Stay isolated in your own little world. Never get involved with anyone else’s life, and you won’t have to try any of these other 15 steps in order to fail at discipleship. On the other hand, if you don’t want to fail at discipleship, just try it. Recognize that you’re learning and growing too, but love people enough to be willing to fail if it means that, overall, you can help them grow in the long run. 2. Condemn everybody… for everything. What’s up with that verse that says it’s the goodness of God that leads to repentance (Romans 2:4)? Yeah, avoid that one if you want to fail at discipleship. Don’t focus on the goodness of God. Don’t emphasize His grace, or His mercy, or His forgiveness. Don’t encourage anyone or tell them how you see them growing. Just criticize everybody for everything. That way, you’re sure to turn people off, break their spirits, and lose whatever opportunity you had to speak into their lives. Yup. Condemnation. That’s definitely the way to go if you want to fail at discipleship. After all, when you first gave your life to Christ, you were perfect right away. So it’s perfectly reasonable to expect the people you are discipling to be perfect too, right? 4. Never be blunt or even honest. When you’re talking about real issues, don’t give honest feedback or direction. Just beat around the bush all the time. If you never say what you mean, your mentee will never know what she needs to do to grow. I speak from personal experience on this one. It’s a terrific way to fail at discipleship. When people reach out to you, ignore them. Never be available by text, email, telephone, or in person. Just be too busy 100% of the time. 6. Think you’re a perfect mentor. Come on. We all know you’re perfect. Admit it! Or… if you aren’t a perfect mentor, at least don’t admit that! This means that, if your advice ever goes over the wrong way–or if you should give bad advice (gasp! )–don’t acknowledge that you, too, are human and could possibly mess up sometimes. For pity’s sake, please don’t go there. Keep the mask on at all times if you want to totally fail at discipleship. 7. Be super-spiritual all the time. Don’t have fun with your mentees. Don’t get to know them. Don’t make memories together. And oh my… FOR SURE don’t let them become your actual friends. Just be super-spiritual all the time. Be sure that all you do together is study and pray. Invite them over for dinner and just have fun together. Do fun stuff like hiking, camping, and going on vacations together. But if you want to totally fail at discipleship, no matter what, DO NOT (I repeat, DO NOT) get life-on-life with people or have fun with them as your actual friends. 8. Wait for them to contact you. ‘Cause, yeah, they will… NOT. See point #2. Don’t build them up. Don’t point out the good things you see in them. Don’t congratulate them on their growth. Don’t send them encouraging words by Facebook or email. 10. Never tell them how they’re growing. Yeah, I know I already said this kind of (see points #2 and #9), but it’s worth its own headline for sure. If you want to totally fail at discipleship, just assume that your mentee can see how they’re growing themselves. Assume they have a bright and positive outlook about everything, and that they have no tendency to get discouraged or look down on themselves. 11. Never pray for them. For mercy’s sake. If you want to fail at discipleship, please don’t petition God to move on your mentee’s behalf, to work in his or her heart, or to (gasp!) disciple them Himself! No, if you want to fail at discipling someone, it’s better not to pray for them at all. Just don’t go there, ok? You’ll fail at discipleship, guaranteed, if you’ll just refrain from praying. 12. Point people to yourself, not to the Word. ‘Cause, after all, what people have been looking for all their lives is YOU. If you’ll make them as codependent as possible on you, instead of teaching them to seek God and mine His truth from His Word, you’ll be SO effective! 13. Think YOU can change people’s hearts (instead of the Holy Spirit). Just be everybody’s Holy Spirit, Junior. YOU do the work in their hearts. YOU convict everybody of sin, righteousness, and judgment. The burden falls on YOU, because you are the solution to all the needs of mankind. The word “taught” there means “discipled.” So if you want to fail at discipleship, definitely don’t claim God’s promise that HE HIMSELF will disciple your children (biological and spiritual). 14. Only teach them theology. Never address real-life issues. 15. Never ask forgiveness when you mess up. ‘Nuff said. Just sit in your ivory tower and steadfastly believe that you can do no wrong… or if you do mess up, just don’t humble yourself. Yes, for pity’s sake, don’t be like Jesus and humble yourself! 16. Think that NOW is always the best time to speak to your mentee about ANY issue. Don’t wait until they’re in the mood to hear what you have to say. Don’t wait to talk until they’re not distracted by something more pressing. Don’t spread your feedback out over time. Hit ’em with all you’ve got at once, so they’ll feel really encouraged hearing about all the things they need to change at once. Don’t wait for God’s timing. Don’t wait for God to open doors for XYZ conversation. Don’t pray about what to say and when to say it. If you want to totally fail at discipleship, just totally ignore the principle of right timing. Say whatever you want, whenever you want, whether your mentee is likely to hear and receive it or not. 17. Do not, I repeat, DO NOT love the people you are fathering. Do not let your heart beat for these people. Do not tell them you love them or treat them kindly. Do not ask God to give you the same love for them that He has. If you want to be a total discipleship failure, just don’t love. I have never met anybody whose life was changed by hatred, guilt, or condemnation. But I do know a bunch of people whose lives were transformed by radical love. Takeaway? If you want to fail at discipleship, stay away from that radical love. Again: to fail at impacting people’s lives, DO. NOT. LOVE. the people you are fathering. (Actually, that’s kind of an oxymoron, because you can’t be a spiritual father if you don’t have radical love for your sons and daughters… but you get my point.) Just don’t go there. 18. Abandon them as soon as things get tough. I can’t even be trite about this. God didn’t give up on you when you weren’t just perfect in every way. So what makes you think it’s ok to walk away from your spiritual sons and daughters when the going get difficult? If you want to fail at discipleship, abandon people when it’s hard. Or, if you want to succeed at discipleship, you could stick with them through thick and thin because you love them. (See point #17.) Up to you. 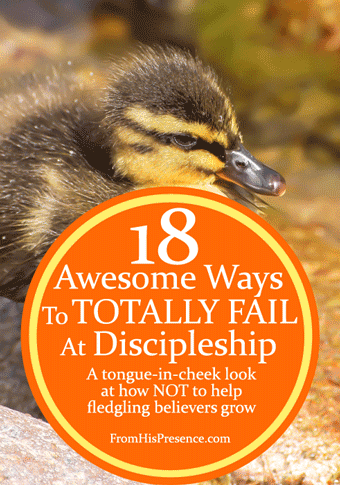 There you go: 18 ways to totally fail at discipleship. 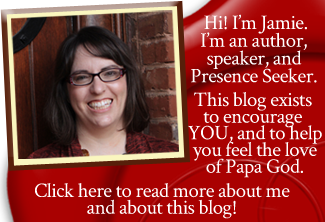 Have you ever practiced any of these ways – or the opposite of them? How did they change your life if so? Leave a comment below; I’d love to hear about it! Image courtesy of Susanne Nilsson on Flickr via creative commons license.